It's Bloom Day! Let's get right to April's lovely flowers at Longview Ranch, shall we? First up, one of my favorites: Lewisia cotyledon 'Sunset Series'. And here it is with a pinker companion from the same series. Not to be upstaged by the newcomers, Camellia 'April Kiss' is still hanging in there with a few perfect blossoms. Cornus 'Eddies White Wonder' is strutting her lovely green-to-cream blossoms. After months of the buds just sitting there, they burst seemingly in a matter of days. Tiny Dodecatheon hendersonii reappeared, like magic! The last of the species tulips, Tulipa dasystemon. Loropetalum chinense 'Sizzling Pink'. The flowers are cute whether they're furled or fringed. Saxifraga x urbinium "Aureopunctata'. 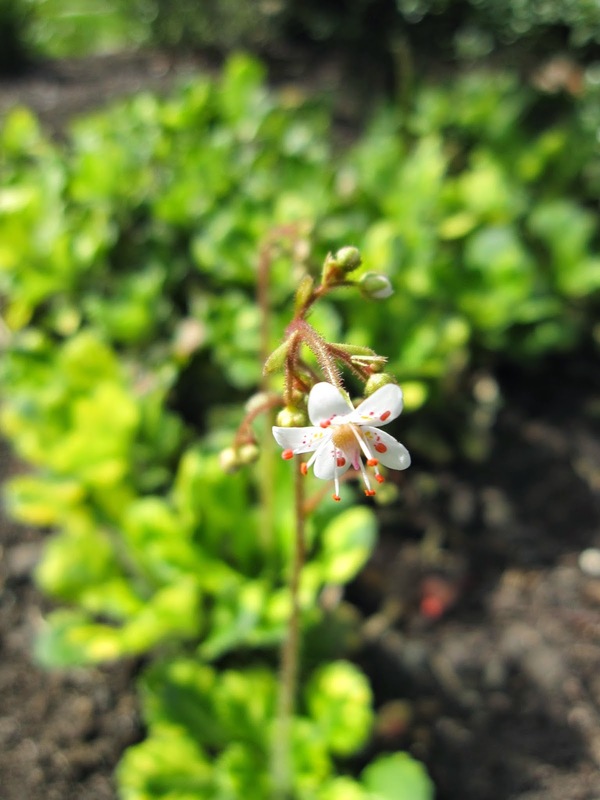 The little flowers are not the reason to grow this pretty groundcover, but the blooms still say spring to me. Armeria maritima. This whole plant is smaller than the palm of my hand. Aeoniums look like flowers all the time, except when they flower! Finally, a couple more plants from Hortlandia. Epimedium grandiflorum, already planted in the Northwest Territory. And a little Erisimum kotschyanum for the sunny front bed. Celebrate Bloom Day by visiting our host, Carol, at May Dreams Gardens and enjoy the wealth of April flowers to be found there.